Uggah (centre) speaks to some of the flood victims at the hall during his visit. 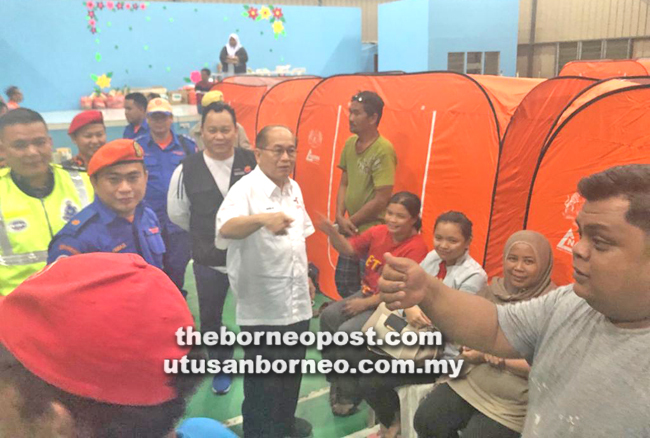 KUCHING: Flood victims at Kampung Lumut in Buntal received a surprise visit from Deputy Chief Minister Datuk Amar Douglas Uggah late Saturday. Uggah, who is also State Disaster Management Committee chairman, arrived at 11.50pm after attending the official launching of Gabungan Parti Sarawak at the Sarawak Indoor Stadium in Petra Jaya. Accompanied by his wife Datin Amar Doreen Mayang, the visit was to check on the welfare and wellbeing of the victims. More than 30 people from nine families there were affected by the flood and were evacuated to Dewan Sinaran Kampung Lumut since the evening. Meanwhile, another 18 persons from three families from Kampung Sungai Batu in Santubong were similarly evacuated to Surau Ar-Rahman on Saturday night. According to the State Disaster Management Committee secretariat, the flood water had started to recede albeit slowly. Meanwhile, non-governmental organisation Hope Place Kuching aided the flood victims by delivering food and other necessities. Its founder Kelvin Wan said aid comprised rice, biscuits, noodles, condensed milk, Milo, milk powder, baby diapers, and others. 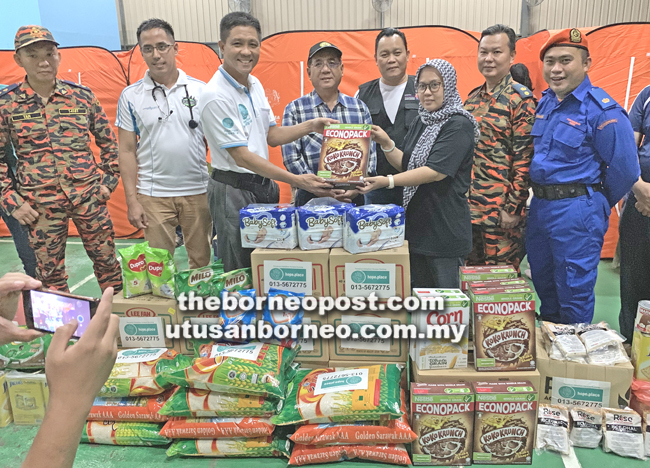 The handing-over of the items was witnessed by Deputy State Secretary Datu Jaul Samion, who is also State Disaster Management Committee deputy chairman. Hope Place carries out its aid deliveries once every three months because of the more than 190 families on its list of recipients. It can be reached on 013-5672775 or 082- 505987 from 8.30am to 12pm and 2pm to 5pm (Monday to Friday), and from 9am to 12pm on Saturdays. Donations can be made to its Maybank account (5112-8900-1160) under the name Persatuan Kebajikan Harapan Kuching. Wan (third left) hands over the food items to a representative of the flood victims, witnessed by Jaul (fourth left) and others.